(June 9, 2018): A little over 20 years ago, soul singer supreme Dionne Farris interpreted a Van Hunt song for the Love Jones soundtrack, and created an adult soul classic. “Hopeless” has lived on as a favorite since then, and Farris continued to impress her fans with her (too infrequent for my taste) recordings. 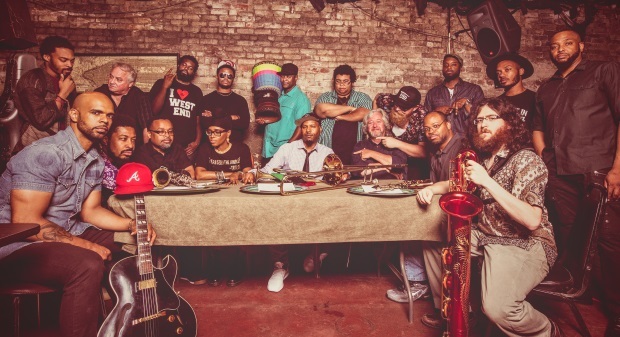 Fast forward to 2018, and the creation of Grammy nominated trumpeter Russell Gunn, The Royal Krunk Jazz Orkestra, which is releasing its debut album Get It How You Live, on July 13. His mission for the 19-piece Big Band, is to breathe new life into “traditional” jazz Big Bands by expanding its possibilities in the modern era, with doses of jazz, R&B, pop, hip hop and funk. Gunn says, “Most of the music on ‘Get It How You Live’ is original compositions that I felt were deserving of expansion into the grander format of a large jazz ensemble.” And it is an attractive mix of new tunes and reimaginations of familiar songs. That brings us back to “Hopeless,” the auspicious addition to the disc, complete with a bigger, jazzier sound that the original version – and a twist toward the end - with Farris back in front, leading with her plaintive vocals and sounding great. We’re proud to present the World Premiere of “Hopeless,” a beautiful new take on an old friend. Check it out and enjoy. feat. Dionne Farris - "Hopeless"